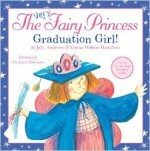 The end of the school year is here, and Very Fairy Princess Gerry is getting ready to graduate! She always loves a celebration, but can’t help but feel a little sad as she empties her cubby, takes down her art projects, and says goodbye to her class pet, Houdini the hamster. She’s also a little nervous about leaving Miss Pym… what if her new teacher doesn’t let Gerry wear her wings and crown? Change can be hard, even for a fairy princess! Thankfully, she realizes that new things can bring their own sparkle. From the mother-daughter team of Julie Andrews and Emma Walton Hamilton comes another delightful story in the #1 New York Times best-selling Very Fairy Princess series. Illustrated by Christine Davenier.